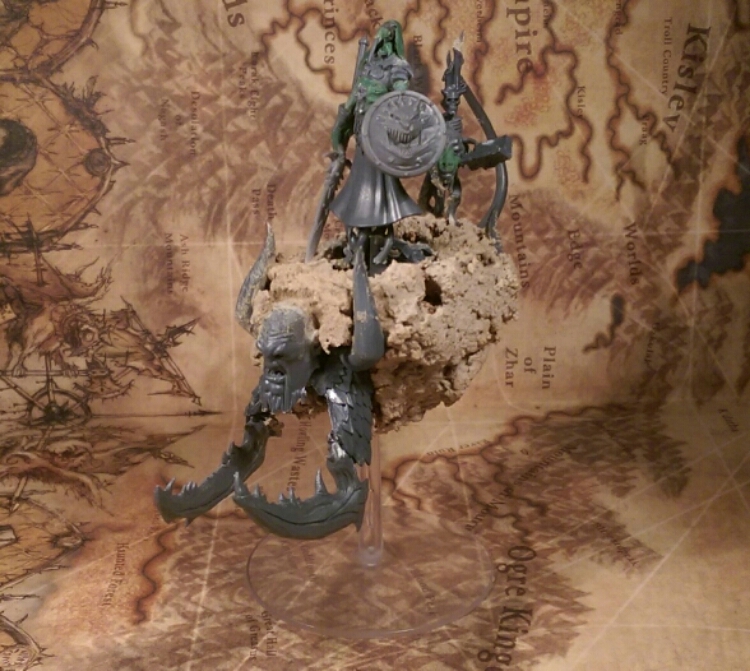 Phiixram, Aether Sfinx..partially manifested in the blood soaked bedrock of the mortal realms..
..on his back a blue scribe of Tzeentch stands..Thramexxus..
What an impressive looking mount! Even without greenstuff it looks really nice. The skeleton on the back with the candle on his head is great. Is the skeleton merged with the scribe holding the book? It is a little hard to tell from the pictures. Regardless, I like where he is going! Hurvald’s shield looks really good too, a perfect fit for the model. It’s merged. 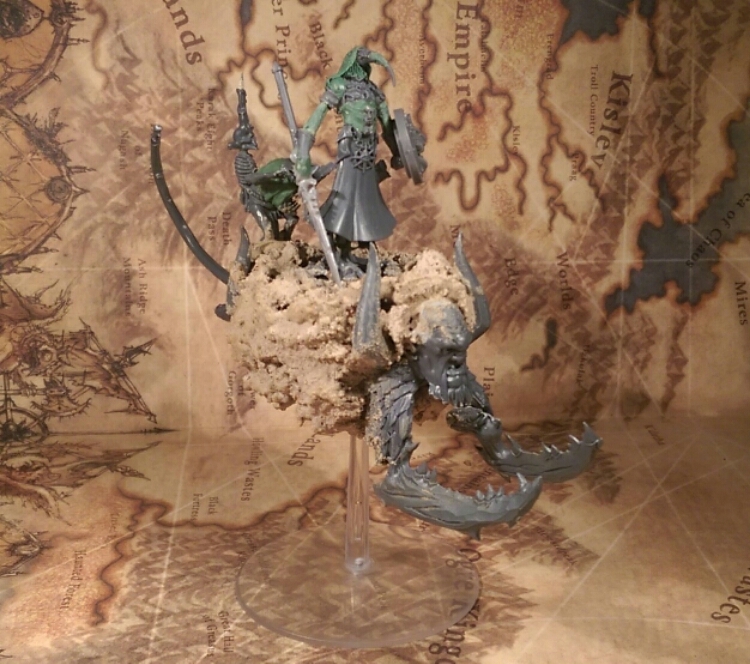 Originally it’s a ghoul with that skeleton a part of the sculpt. The new skeleton head with a candle is added by me and the new head on him as well. I’ve shown him earlier as part of the two familiars I made for Hurvald. The things you come up with are out of this world man! Great work! Is Hurvald permanently attached? Cheers 🙂 He is now yeah, on the picture he’s not that’s why he’s slanting a bit. He’s fixed on a stem and I’ve added more greenstuff tendrils to the ones already part of the stock model. Very nice, incredibly mad, totally Tzeentchian! Take it the heart of the disk is cork? How well does greenstuff stick to it (never tried to the two together before)? 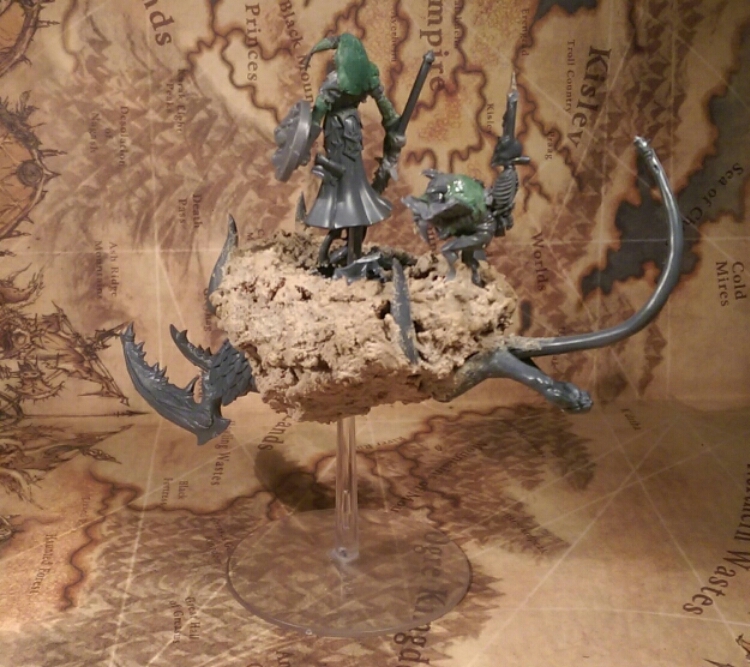 The core is that flying High Elves bird from that starter box with the skaven. I mounted an oval base on the back and then I clad it in cork and then used my pva glue / sand / bicarbonate soda covering the cork. I’m not greenstuffing that bit, only the plastic bits.